Updated 9:41AM, Wednesday April 18th, 2012	by Sam Hailes, Christian.co.uk Be the first to comment! Ruth Valerio spends much of her time helping Christians live simpler, greener lives. 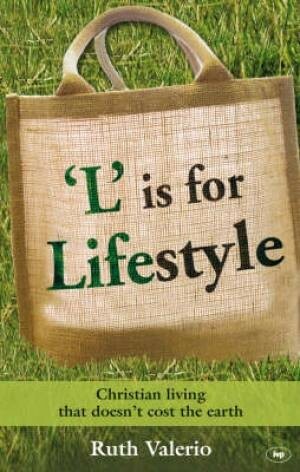 Her book L is for Lifestyle was written to both provoke and enable a more thoughtful lifestyle. She is part of Spring Harvest’s leadership team and is looking at the concept of simplicity and consumerism for her doctoral studies at Kings College London. 1. When did you first become interested in green issues? I read a book called Whose Earth by Chris Seaton. It was the first time I came across specifically green theology. I can remember sitting on my bed reading it, it absolutely hit me and kind of converted me. I suddenly realised what a state the world was in and how it was our fault as human beings. I came to see that [living a green lifestyle] was an essential part of what it means to be a follower of Jesus, not just a little add-on for a few strange sandal-wearing people. 2. Is it the scientific warnings about the earth being in trouble, or your faith that drives you? Everything comes from my faith, it’s central to who I am and how I live. Because I think that God has put us in this world in order to take care of what he has made, that has become my driver. I set out on a journey to change the way I was living and hopefully in the process help others change as well. 3. What changes have you made? I’ve become a lot more aware of the impact my everyday actions have and much more questioning of my everyday actions. Some people might call it obsessive. [In] everything I do, I’m asking: 'Is there a way that I can do something that would use less energy and do less harm to animals, people or the earth?' That means my whole framework for life has changed. Transport has changed, I use the car much less than I would have done. I haven’t flown anywhere in four years. Being very energy conscious and always looking at how we can use our energy better. We had solar panels fitted last year. Food has been a massive change. Even though we live on a council estate, we’ve found ways of producing our own food, without doing the Hugh Fearnley Whittingstall thing of moving to the country. All it takes is creativity and a willingness to think outside of the box. It doesn’t always cost more. 4. Do you find it hard to convince others this is an important issue? There was an Evangelical Alliance survey last year. 97% agreed it’s a Christians responsibility to steward the world. Where I think the nub comes is what we do about it. That’s much more complex and demanding. Moving from theory to practice is the challenge. 5. Why did you write L is for Lifestyle? I noticed all of the books that were coming out, focused on an environmental theology. I wanted something that has a lot of Biblical content in it but that really majored on what we can do about it. When we see things on the news, we can be like a rabbit caught in the headlights. We know there’s a massive problem, but we feel paralysed. What I wanted to do with L is for Lifestyle is break down the big issues of our world into bitesized chunks and give people some understanding of the issue and clear action points. 6. Surely anything we can do is just a drop in the ocean? Do you get disheartened? You might look and think, 'I’m never going to see everyone I know become a Christian, therefore I’m not going to bother [with evangelism]'. That’s not the motivation behind it. My motivation for why I do what I do doesn’t stem from the 'can I make a difference?' question, which is quite a utilitarian approach. I do want to make a difference, but our primary motivation within a Christian framework is: 'What’s the right way to live as a follower of Jesus?' That’s a much more helpful way of looking at it. 7. What has God been teaching you recently? If I were to talk about trust, it sounds very cliché and easy but in reality it’s very difficult to live out, particularly financially. My husband and I don’t have a secure economic foundation. What I’ve been learning is what the phrase ‘seek first the Kingdom of God and all these other things will be added to you’ means. Over the last year, I’ve had to learn what it means to do what God is asking us to do, which seems mad to others, and trust that God will financially supply the rest. That has been a really tough walk, but it’s amazing to see that it’s actually happened. The Resurrection of the Son of God by Tom Wright [NT Wright]. I love his Biblical thoroughness and his views on eschatology and the historical reliability of the resurrection. It set me on fire again and filled me with passion for life. It was wonderful. 9. Have you adopted a vegetarian lifestyle? We’re not vegetarians. We produce our own pigs and pork but we do eat a lot less meat than we would have done. That’s one of the most important things anyone can do – is eat significantly less meat. As a society we eat far too much meat and we need to cut that down by about 80% or 90%. One reason is issues of animal welfare. The majority of meat that we eat comes from factory-farmed animals. It is wrong as a Christian to eat meat from factory farmed animals. It’s contradictory to who we’re supposed to be as Christians. 10. Do you see yourself as a 'radical'? I think we need to up the anti of what we’re doing. It’s not enough to recycle, reuse carrier bags, use low energy light bulbs. I think we need some radical changes. How can we not want to live in a way that does as little damage as possible, to this world that has been made by Him, through Him, for Him as Colossians says? We need to live as radical lives as it takes.